Peplum top from Italian merino wool. Why peplum : because we should all have this style in our wardrobe, and one knitted from a luxury yarn is more comfortable and sensual than a tailored one. Why the sleeves: we love to highlight through powerful/statement elements a woman’s arms, they are for us a metaphor of strength and love. We did this through our Mother Goddess statements , through the folds on our cashmere cuddles, the volume on our Art Dye project. For this design we chose the contrast of rhombs and spiraling lines for a power woman esthetic statement. Urban Queen is knitted in one ply of a superfine, Italian merino. 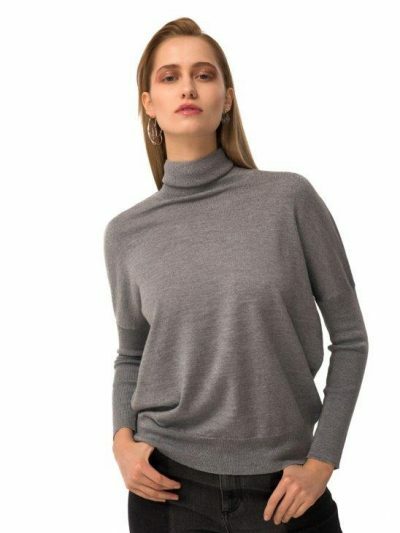 For comparison, it feels closer to a regular cashmere sweater than to the extrafine Italian merino used in our Jaquard type knits. 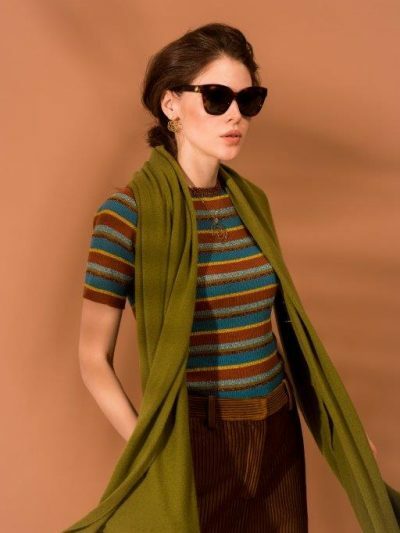 Skinny jeans, leather trousers, formal trousers, palazzo trousers, ruffled trousers – yes, the most relevant piece for styling this beautiful top is the trousers you choose to pair it with.